This method of growing hydroponically is very easy and is an ideal introduction to growing without soil. It also needs very little equipment, yet should still allow you to grow plants better than simply in soil. The method you can see in the picture is the way I will be trying to passively grow tomatoes and cucumbers this year (2006), as we currently don’t have a greenhouse with electric power this is an ideal time to try this method. The system is set up by filling up a pot with some medium for the plant to grow in, rather than soil this could be either perlite or clay pebbles which are both popular neutral growing mediums and are easy to purchase in garden centres. The medium is rinsed thoroughly before being placed into the growing pot. If you are using perlite make sure you rinse this in a well ventilated area as dry perlite is very dusty, also make sure the pot you are using has drainage holes in the bottom. The plant is then placed into the medium like you would plant a normal plant into soil. I have grown my plants from seed and grown them entirely in rockwool cubes so I can just place the cube with the plant straight into the pot. This also means no mess, apart from the perlite which can make the area look like it’s just snowed and it also gets very sticky when wet. The pot and plant is then placed into a pot saucer tall enough for quite a bit of nutrient solution(Water and Nutrients) to sit in, the nutrients are then used to water the plant as you would water a normal plant in a pot so that the nutrients flow through the medium into the saucer at the bottom. This process will probably only need to be done every few days when the plant is small but might need to be done once or maybe twice a day if it’s warm weather or the plant is growing large and using lot’s of nutrients. I will be growing quite a bit with this system this year (2006) and will keep my web site updated with photos and any progress so keep checking back. 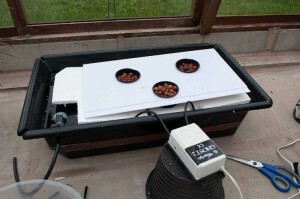 This entry was posted in Hydroponics, Methods and tagged fruit, greenhouse, growing, hydroponics, methods, passive, plants, seeds, vegetables by Paul_E. Bookmark the permalink.